If you’ve been charged with a crime in Michigan, you need a criminal defense attorney who will fight to protect your interests. Get Hilf & Hilf on your side today for immediate action. A criminal charge can follow you around for years. It can affect your ability to gain employment, purchase a home or car, even ruin relationships. When your freedom is at stake, Hilf & Hilf provides proven legal strategies that gets you the results you need in order to move on with your life. It’s essential that you seek the counsel of an attorney who specializes in criminal defense, and has experience getting results for individuals who have faced similar charges as you. There are many lawyers who claim to do more than what they are able. Do not settle for a legal hack job. Practicing law is a skill that develops over time with experience, commitment, dedication, and talent. There are no amateur attorneys at Hilf & Hilf, PLC – only professionals that are guided by the humanity in the individuals we serve, and the drive not to settle for what is easy over what is right. Remember, hiring the right criminal defense lawyer may be one of the most important decisions you make for yourself and your family. "Dan is the best. He represented me on a criminal case in Oakland County Circuit Court. He fought from the start of the case until he won at trial. He is smart and fearless. I strongly recommend him to anyone looking for a great lawyer." "This first thing that comes to mind when I think of Daniel Hilf - he is restless. He will not stop until his clients receive fairness and justice. Daniel fights for people and gives them a voice. He will go to bat for people, not for a paycheck, but to stand up for the 'little guy.' I recommend Daniel Hilf, as I know personally he is a great defense and immigration attorney." 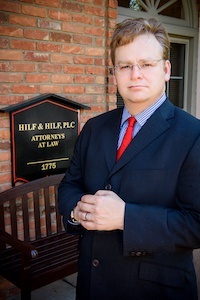 Contact Hilf & Hilf today for a consultation to discuss your case.